The process of becoming a full time bilateral prosthetic user is typically not an easy one. It involves well defined steps in order to achieve being a full time prosthetic user with bilateral above knee prosthetics. For the individuals that have made the commitment to this process, they continue to push the limits of perceived boundaries that can ultimately be overcome. Following an amputation, there is usually a significant amount of pain caused by the surgery process. There are two types of pain that a new amputee will usually experience. First, there is pain from the actual surgery that usually will subside as the limb heals over the first few months. Second, is phantom limb pain that can be pain that seems to originate from a part of the amputated limb. The brain will tend to continue to seek feedback from the missing limb and this can cause a feeling of discomfort as the brain still thinks the missing limb is still attached. The result is the sensation of a stabbing or electric shock from the image of the missing limb. Nerve and pain medications tend to help mask the phantom pain but there can be many side effects from using these powerful drugs. The most successful and functional bilateral above knee prosthetics users have found that applying pressure and contact to the ends of the residual limbs helps to "retrain" the brain to accept the amputated limb as the new ending place of the body. Massage can also help this process be more effective and will also help to desensitize the nerve endings in the residual limb. Another helpful practice is to do exercises with the missing limb in your mind. For example, the brain still thinks the amputated foot is still in place so by moving the toes and making a fist and squeezing all of the toes or stretching and wiggling the toes has been found to be very effective for many bilateral above knee amputees. 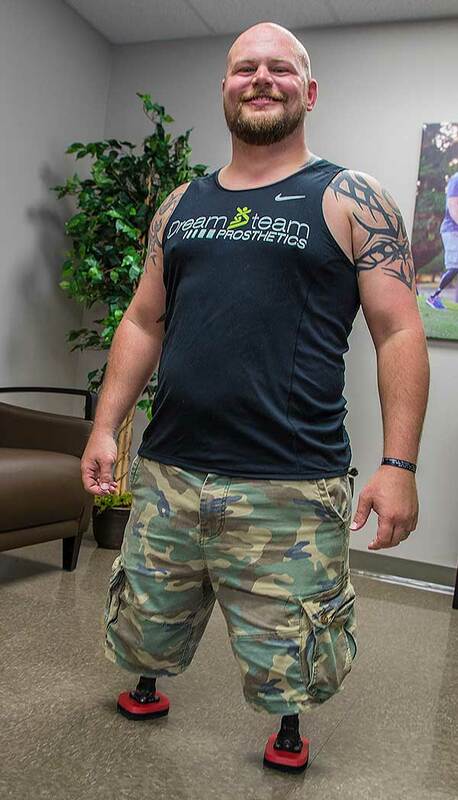 For a bilateral above knee amputee, the fitting of the prosthetics can be very exciting. It takes a very skilled prosthetist to capture the unique shape of the residual limbs of an individual with bilateral above knee limb loss. The prosthetic sockets must be able to accommodate limb movement as well as take into account how the limbs will interact together and still maintain a high level of control. Regaining lost mobility is the goal of using prosthetics and at first it can be a very daunting task. It requires a lot more energy to walk using prosthetics and it takes time to build up strength and endurance. That is why starting out with "stubbies" or fore shortened prosthetics is a critical aspect of the process. It is important to incorporate the "stubbies" into daily life activities such as going to the grocery store or pumping gas. The more you do with the "stubbies" will help you to build the necessary strength to enable using full-length articulating prosthetics. The customized design and fit of the prosthetic socket for a bilateral above knee amputee is they key to being a fully functional and mobile prosthetics user. The type of suspension used will be determined by the length and condition of the residual limb. A direct skin fit suction socket will provide the highest level of control over the prostheses. Some limb conditions may dictate the use of a gel liner as a buffer between the residual limbs and the structure of the prosthetic sockets. There are several different types of "stubbies" feet that are available today. Some have articulating joints or elongated platforms to provide excessive stability that can make using the "stubbies" easier in some instances. For instance, some people think a very large platform will provide increased support while standing, while others think articulating the platform will help absorb irregularities in terrain. However, we have found that the, low profile custom contoured "stubbie" foot provides the necessary stability without compromising the ability to build muscle tone. 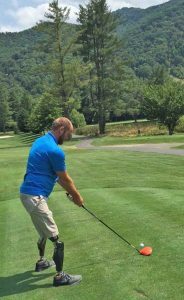 For most, the use of "stubbies" is a way to have immediate mobility and will eventually lead to full length prosthetic use with microprocessor controlled hydraulic knee systems. The "stubbies" are a tool that will always be useful in many different situations face by an individual with bilateral above knee limb loss. There is an inherent functional advantage to be lower to the ground and have a more manageable center of gravity when doing activities such as carrying heavy objects or fishing on a boat. It is up to the user to select the best mobility option for them in each situation. By keeping the same socket and switching out the lower components is the most efficient way to adapt to different activities. It is also much more convenient when traveling to not have a pair of sockets for each component. Most full time bilateral above knee prosthetics users find that eliminating the wheelchair completely is not only a much easier way to stay focused on improving prosthetic use, but when traveling it becomes much easier to navigate without having to bring a wheelchair along. If your goal is to be independent and walking full time, using a wheelchair is contradictory to that goal. For many the ultimate goal is to use full-length microprocessor controlled prosthetics for their daily mobility. 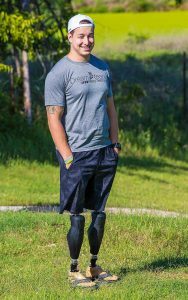 Once an individual has built up the strength and endurance using the "stubbie" prosthetics, the transition to full-length legs is much easier. The main thing to remember is this process is based on function not on time. An individual must be a full time prosthetics user with the "stubbies" for months and obtain the skills to climb stairs, step off curbs, walk on uneven terrain, carry heavy objects, walk long distances and use the prosthetics for 10 - 16 hours each day, everyday. If you try to use full-length prosthetics too soon, you will know it because of how daunting a task it is to just walk on a flat surface with the increased height and an articulating knee. If this occurs, go back to the "stubbies" for several more months until you are ready for a more efficient transition. This may seem to be a step backwards, but it is actually just the opposite and confirms that the longer you use the "stubbies" the easier the transition to full-length legs will be. For more information about the most appropriate and functional microprocessor knee system for an individual with bilateral limb loss, read our blog post about Microprocessor Knee Technology.